The WaterRower GX has been developed from the commercially successful "Indo-Row" and "Shockwave" classes. Handcrafted in the USA, it's made from solid Ashwood and features an Aluminium monorail design. For over 20 years WaterRower has been combining stylish design, handcrafted workmanship and ethically sourced material to create the world’s finest rowing simulator. 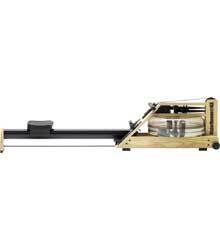 The WaterRower's patented Water Flywheel has been designed to emulate the exact dynamics as a boat moving through water. Unlike conventional rowing machines, WaterRower spreads the work uniformly over all muscle groups, making it the most efficient aerobic exercise available. Combining control, strength and stamina in one complete exercise, rowing burns fat, strengthens your cardiovascular system with no detrimental impact or load on your joints. It is the ultimate cross trainer and for reasons of ecology, all our woods are harvested from replenishable forests. Includes the GX training monitor which offers programmable time and distance workouts. BONUS - Includes both the Indo-Row and Shockwave workout DVDs valued at $79.90!